Can Aerobics Exercises Prevent Dementia? Seniors who do aerobic exercise on a regular basis may be at a lower risk of developing dementia. The great news for dementia caregivers in Rhode Island that look after seniors is that there are many aerobic exercises that can easily be done at home. 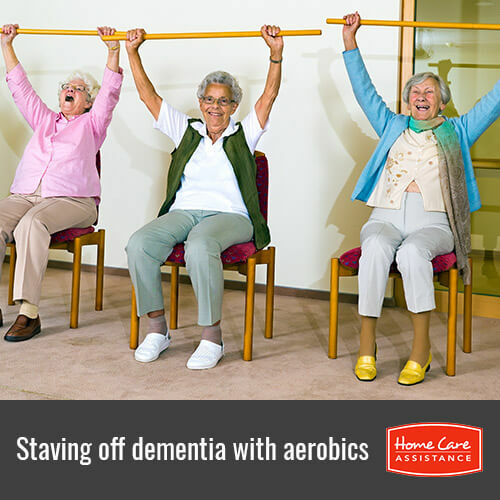 Read on to learn how aerobics can help stave off dementia symptoms. Aerobic exercise raises the heart rate for at least 120 minutes per week. Seniors can break that time up in any way that works best for them, although 30 minutes four times a week is recommended by some doctors. Seniors can choose from any form of aerobic exercise that raises the heart rate including brisk walking, running on a treadmill or even dancing. If your senior isn’t fond of exercising, then suggest helping clean the house at a brisk pace or gardening to compensate. The goal is to do an activity at an intensity level that it makes it difficult to carry on a normal conversation. Doctors are not sure exactly why doing aerobic exercise helps to stave off dementia. Many believe that the effects come from improved cardiovascular health, which increases the amount of blood flowing through the brain. Research also suggest that aerobic exercise may help stop harmful plaques from forming in the brain. When the plaque does not form, seniors are better able to continue with daily living skills, experience fewer psychological effects and can stay mentally and emotionally engaged for longer periods of time. Some studies even suggest that seniors who perform aerobic exercise on a regular basis can multitask better than those who do not. Some home care agencies in Rhode Island recommend that the earlier a person starts exercising, the better the results will be later. Almost all studies suggest that seniors need to exercise for at least a year before the results can be measured. Even if further research does not support these early findings, there are many benefits of exercising including increased flexibility, increases in range of motion and better cardiovascular health. Help your loved one get the exercise he or she needs to boost overall wellbeing when you call Home Care Assistance. Our reliable live-in and hourly caregivers in Rhode Island help clients exercise safely in order to boost both physical and mental wellbeing from home. Call (401) 284-0979 today to learn more about our services and how we can customize them to meet your loved one’s needs.